4.3.3. What is the difference between themes and page skins? Skins is an experimental feature for theming pages. While you can change a lot of style elements, changing all of them is not advised depending on the theme that is underlying your page. Once this parameter has been added, you will see the menu item Skins under Portfolio and can also choose a skin when creating or editing a page. Click the Edit button to make changes to this skin. Click the Export button to export only this one skin. Click the Delete button to remove this skin. Click the Favourite button to mark someone else’s skin as a favourite one so you can choose it for your own pages. It will turn yellow. Clicking the button again will allow you to remove the skin from your list of favourite skins. You can only favourite another user’s skin, but not site skins. You can always select a site skin for a page, but only see other people’s skins when you favourited them. Skin accessibility: Decide here who shall have access to your skin. The default is This is a public skin. Click the Save button to accept your changes or click the Cancel button to abort your changes. 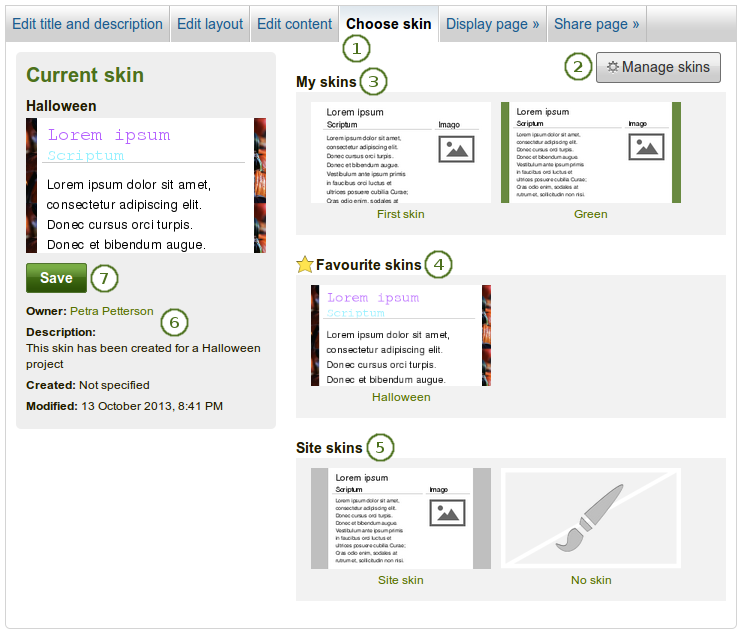 Skin background colour: You can tick the checkbox to have no special skin background but use the theme’s background. Alternatively, you can click into the field and select the colour you would like to use or type the colour code in. Skin background image: You can choose to use an image as background. Click the Select a file button to choose an image from your files area. Background image position: Decide where your background image shall be anchored. Click one of the arrows to select the position. 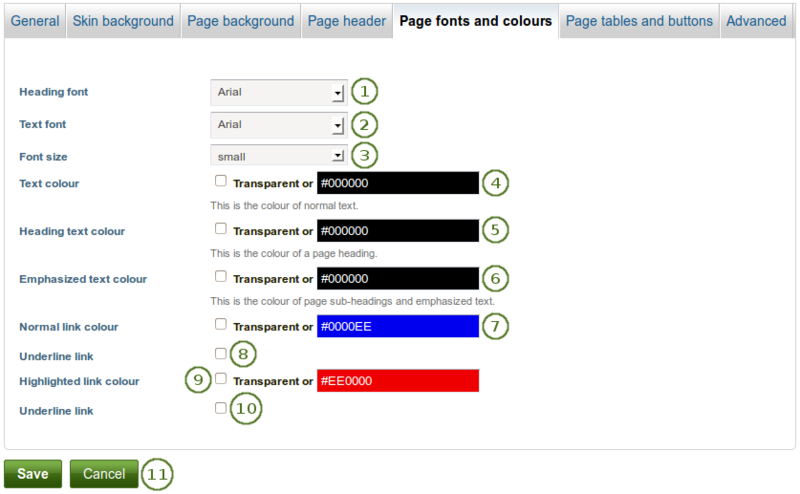 Page background colour: You can tick the checkbox to have no special page background but use the theme’s background. Alternatively, you can click into the field and select the colour you would like to use or type the colour code in. Page background image: You can choose to use an image as background. Click the Select a file button to choose an image from your files area. Page width: Decide how wide you would like your page content to be. You can only choose from the given values. Background colour: Choose the background colour of your header (and footer). Text colour: Decide on the colour for text that appears in the header. Underline link: Tick this checkbox if you want your links to be underlined. If you do not want to use a custom colour but retain the theme colour, tick the checkbox Transparent. Underline link: Tick this checkbox if you want your highlighted link to be underlined. Logo: Decide which logo you wish to use. Default theme logo: Display your theme’s logo. This can be a custom logo. White Mahara logo and text: Choose this logo if you want to display the Mahara logo in white. This is suitable for dark backgrounds. Dark Mahara logo and text: Choose this logo if you want to display a dark Mahara logo. This is suitable for light backgrounds. Table border colour: Choose the colour for your table border. Header background colour: If you set up a table with a header row, you can pick the background colour here. Header text colour: If you set up a table with a header row, you can choose the header text colour here to go with the header background colour. Background colour for odd rows: Choose the background colour for odd rows in a table. You do not need to specify which rows are odd. Background colour for even rows: Choose the background colour for even rows in a table. You do not need to specify which rows are even. Normal button colour: Choose the colour of your buttons that are displayed on a page. Highlighted button colour: Choose the colour of your buttons when you hover over them. Button text colour: Choose the colour for the text displayed on your buttons. Please note that this colour needs to work for both the normal button and the highlighted button. 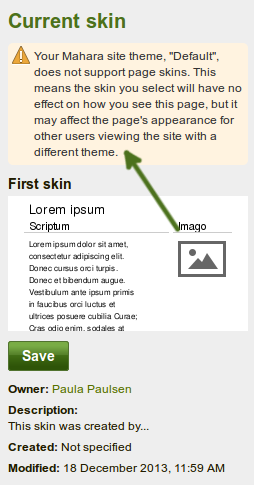 If you had selected a skin, but do not want to use it on your page anymore, click the “No skin” image and you will use the regular theme only. Once you have selected your skin, click the Save button to select it for your page. You are taken out of the edit mode because you can only view your skin when the page is displayed. If you want to make further changes to your page content, click the Edit this page button. This option works best when users cannot choose the theme in which they want to browse the site. If they do and choose a different theme from the institution theme, then they could see the skin applied to the page because then the underlying theme is their personal one which may allow skins.